Known as ‘the game of kings,’ the gallant sport of horseback polo dates back to the sixth century BC when it was developed as a training exercise for cavalry troops in Persia. 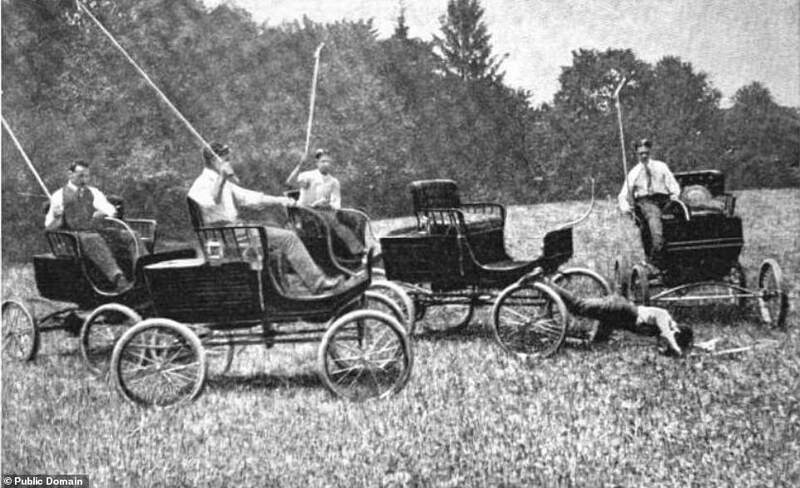 Given that automobiles were promoted as replacement horses, it was perhaps inevitable that the game of auto polo would be invented. 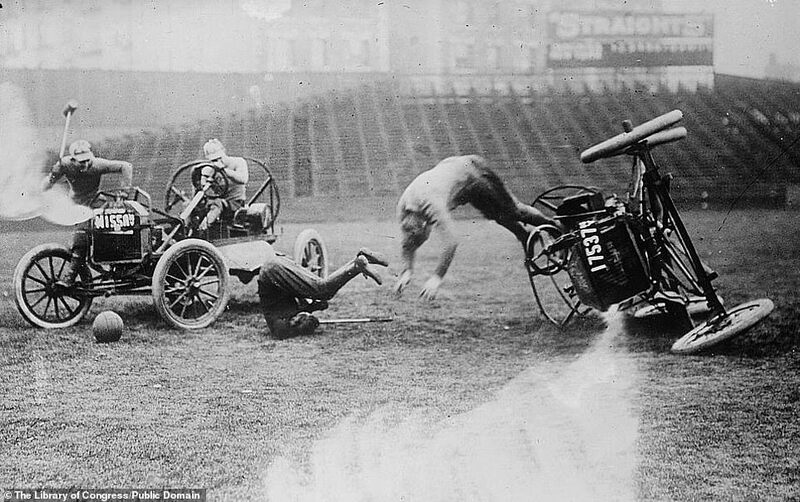 However, a new death-defying sport that replaced horses was far more dangerous than its predecessor, as cars careened around an arena at their maximum speed of 40mph – wielding ball smashing mallets and often ended in a smoldering heap of totaled cars. The novel game, dubbed ‘the undertaker’s delight,’ was the brainchild of car salesman, Ralph ‘Pappy’ Hankinson who hosted the first auto polo match as a way to drum up business for his Ford dealership in Wichita, Kansas. The first match was played in July 1912 on an alfalfa field with 5,000 spectators. Hankinson decided to take his well-received show on the road, creating professional teams that competed across county and state fairs. He made slight adjustments to the standard Model-T car, stripping the vehicle down to the bare skeleton and patenting a protective hoop to function as a safety roll bar. Viewers were hooked on the sensational thrill of cheating death. Drivers whipped cars back and forth, turning on a dime and charging at one another like an uncompromising game of chicken. The mallet man stood on the car’s right side step to drive the ball closer to the 15-foot goal posts; often being thrown from the vehicle in the proves. 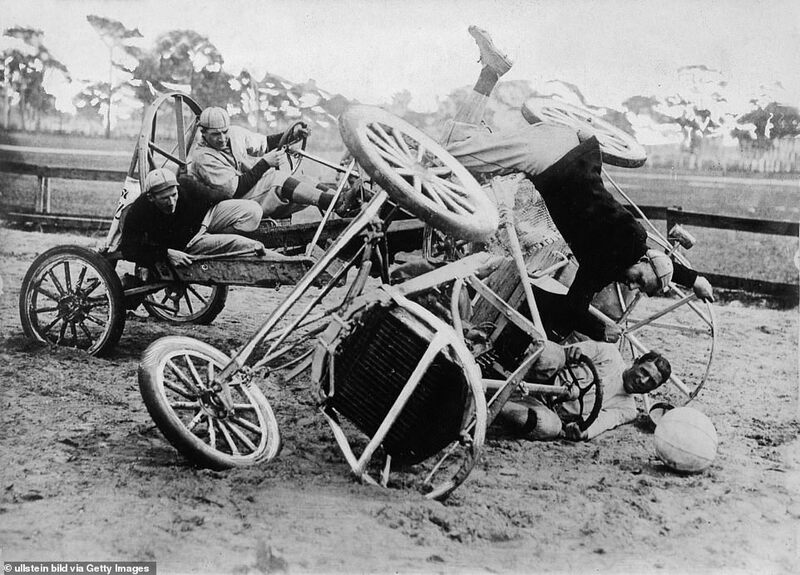 Flipped cars were a common occurrence and often the only circumstance when referees called time-out to give the players a moment to right their vehicle. 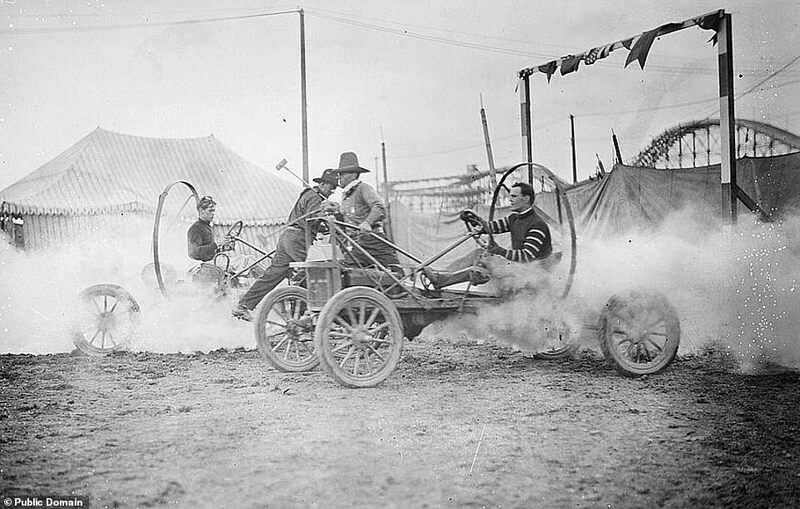 The rules of the game were similar to equestrian polo with natural revision to consider for the difference between animals and their modern-day gasoline counterpart. The mallets were modified with counterweights to prevent kickback and standard-size basketballs replaced the small wooden ancestor. 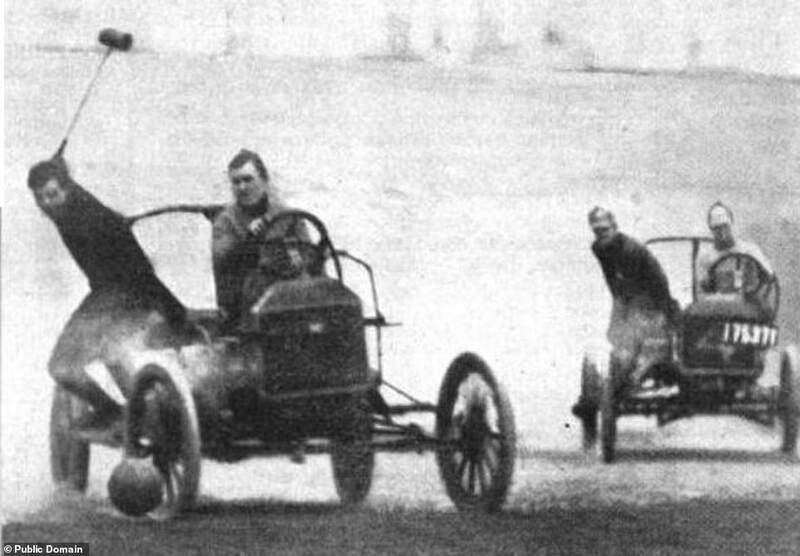 Each team was comprised of two cars with two players. Five periods of ten minutes each constituted a full game and one minute intermissions were granted for quick mechanical repairs. 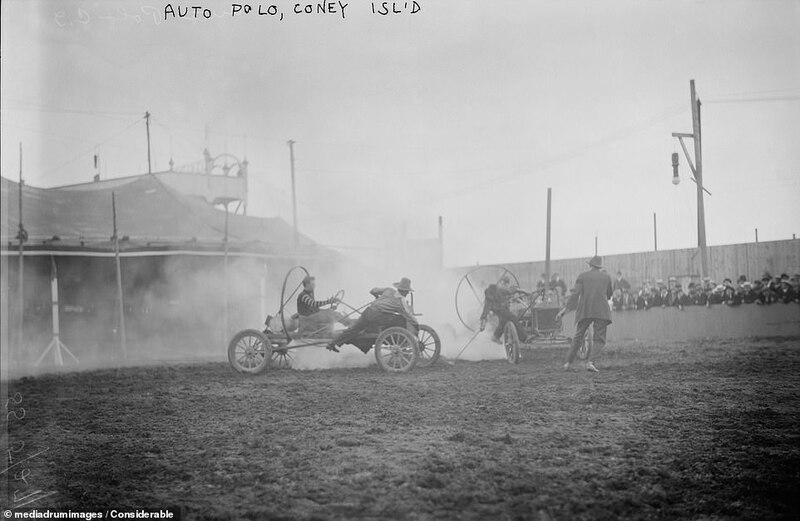 Auto polo clubs quickly began to pop-up across the country. Americans had an insatiable appetite for the demolition derby-esque sport. ‘If you don’t die of fright, you’ll laugh yourself to death’ a fan told the Miami news. By the 1920s New York became a principal city, with matches held nightly at Madison Square Garden and Coney Island. The brutality of the game made it the only sport with a surgeon on hand to administer to bruises, broken bones, deep cuts that occasionally ended in death. While the uncompromising nature of the game made it very expensive since the grunting mechanical ponies were usually totaled by the end of a match. 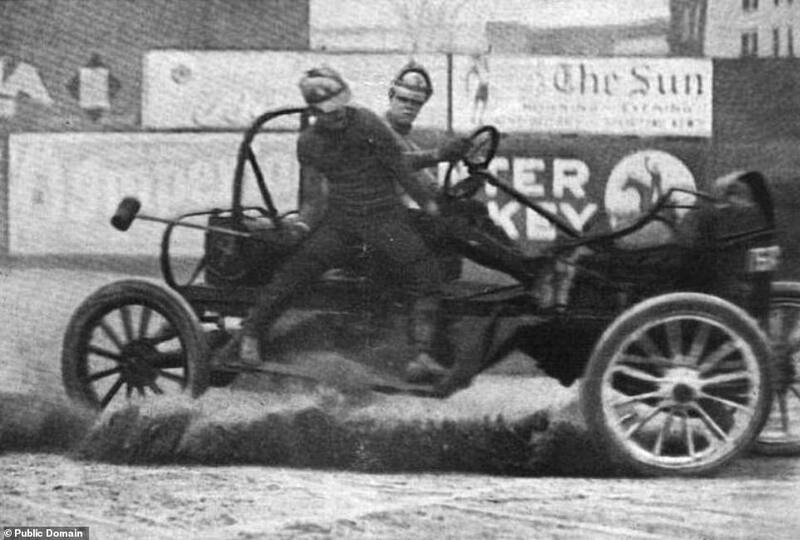 A tally of the damages racked up by American and British auto polo teams in 1924 accounted for 1564 broken wheels, 538 burst tired, 66 broken axles, 10 cracked engines and 6 completely destroyed cars over the course of a year. As reported by The Hartford Courant in 1925, ‘Even Lloyds of London won’t insure players’. Lloyds of London being insurance company famous for underwriting high-risk policies. 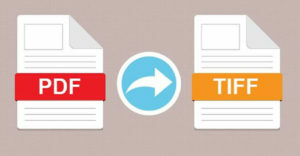 The costly and hazardous elements of the sport ultimately led to its decline. The Great Depression began to take its grip on America, leaving little room for superfluous spending… for even the most indulgent adrenaline junkie.